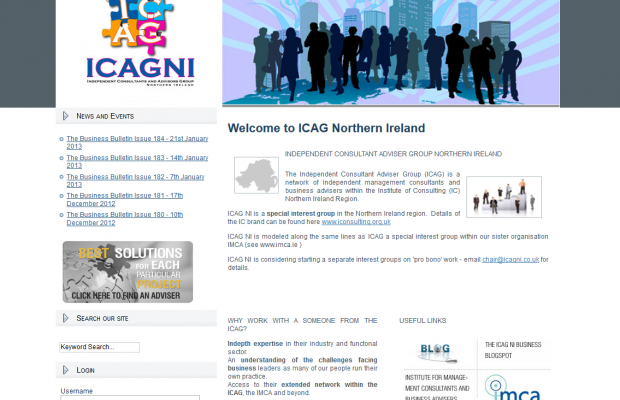 The Independent Consultants and Advisers Group (ICAG) is a network of independent management consultants and business advisers within the Institute of Business Consulting (IBC) NI Region. As a network of business advisers we were keen that our web-site should be easy to browse and convey a professional confident look. StevensonIT.com was able to capture our needs easily and produced a detailed but easy to view web presence within budget and on time. As chair of ICAGNI I recommend David Stevenson to any clients who need a web presence or who want to improve their web image.